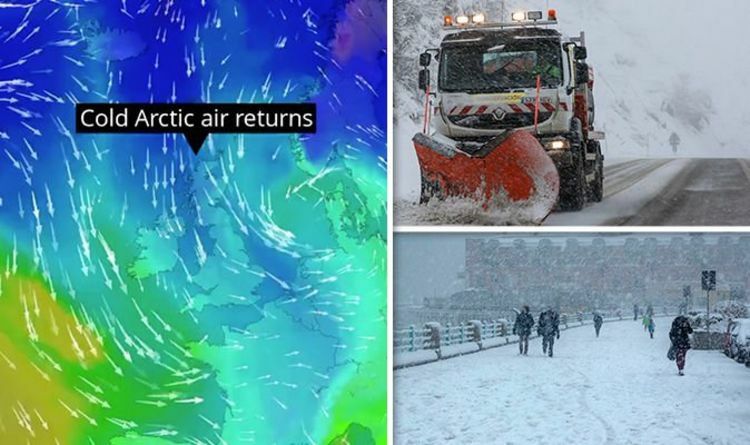 The Met Office has issued shock snow weather warnings this week ahead of an Arctic blizzard over the coming days. The weather is set to take a turn for the worse, as temperatures plummet into a deep freeze during February. The bitterly cold Arctic winds will arrive in the UK by Monday, prompting a shocking -11C freeze. The Met Office issued a snow warning earlier this morning across Scotland. The weather service claimed that snow will spark travel chaos across northern Scotland, with the risk of “blizzards on high ground”. The rest of the UK is forecast to experience relatively mild temperatures today, with rain instead snow causing the majority of difficulties. However, this will come to an end by next week with an Arctic snow front set to smash into Britain by Monday. This comes as Met Office meteorologist Aidan McGivern warned temperatures will drop on Tuesday, with an increased risk that parts of southern England and Wales could be hit with “disruptive” snowfall. The cold weather freeze will start with a dramatic drop to -5C on Sunday night. But this will get worse as bone-chilling Arctic winds continue to arrive, plunging the country into a deep freeze for days. Met Office spokesman Steven Keats warned: "There’s potential we could see widespread snow Tuesday and Wednesday in southern parts of England." Exacta Weather’s James Madden added: “Next week looks like bringing further very cold weather and snow which could affect much of the country. The -11C Arctic winds could spark up to 34cm of snow over the hills of Scotland by Sunday next week. Weather charts by WX show that most of the country will be submerged in snow overnight next Wednesday.